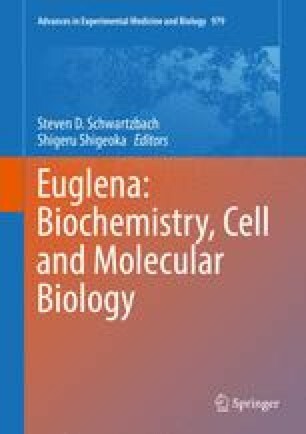 Euglena can use light and CO2, photosynthesis, as well as a large variety of organic molecules as the sole source of carbon and energy for growth. Light induces the enzymes, in this case an entire organelle, the chloroplast, that is required to use CO2 as the sole source of carbon and energy for growth. Ethanol, but not malate, inhibits the photoinduction of chloroplast enzymes and induces the synthesis of the glyoxylate cycle enzymes that comprise the unique metabolic pathway leading to two carbon, ethanol and acetate, assimilation. In resting, carbon starved cells, light mobilizes the degradation of the storage carbohydrate paramylum and transiently induces the mitochondrial proteins required for the aerobic metabolism of paramylum to provide the carbon and energy required for chloroplast development. Other mitochondrial proteins are degraded upon light exposure providing the amino acids required for the synthesis of light induced proteins. Changes in protein levels are due to increased and decreased rates of synthesis rather than changes in degradation rates. Changes in protein synthesis rates occur in the absence of a concomitant increase in the levels of mRNAs encoding these proteins indicative of photo and metabolic control at the translational rather than the transcriptional level. The fraction of mRNA encoding a light induced protein such as the light harvesting chlorophyll a/b binding protein of photosystem II, (LHCPII) associated with polysomes in the dark is similar to the fraction associated with polysomes in the light indicative of photoregulation at the level of translational elongation. Ethanol, a carbon source whose assimilation requires carbon source specific enzymes, the glyoxylate cycle enzymes, represses the synthesis of chloroplast enzymes uniquely required to use light and CO2 as the sole source of carbon and energy for growth. The catabolite sensitivity of chloroplast development provides a mechanism to prioritize carbon source utilization. Euglena uses all of its resources to develop the metabolic capacity to utilize carbon sources such as ethanol which are rarely in the environment and delays until the rare carbon source is no longer available forming the chloroplast which is required to utilize the ubiquitous carbon source, light and CO2.